Cross-pollination of crops by bees affects 30% of the food we eat, and 90% of the survival of wild plants, so if we want the world to be a healthy, happy place for years to come (which we do! ), bees and pollinators play an essential role. And so does bee-education and care! Buddings has always advocated for bee-awareness, including our first bee party in 2015, fieldtrips to apiaries around the city, and of course, our company logo and mascot! Teaching kids (and parents) to love bees is part of our mission! After a landslide vote, in 2017, we even partnered with local Vancouver social change organization Hives for Humanity, for all our charitable and fundraising donations. Through our Terracycle recycling initiative, and semi-annual clothing swap donations that year, we raised $680. Who is HIVES FOR HUMANITY? You may already bee-lieve in bees, but our friends at Hives for Humanity foster a love for bees, and their care, that also provides skills and training to humans on the downtown eastside in need of support. The money we raised last year helped youth and adults facing barriers learn how to care for bees, nurture a hive, and how to grow food – that feeds youth and adults facing barriers! Participate with planting a bee garden, play bee games, and explore the interactive (safe!) exhibits and equipment that bee-keepers use everyday. 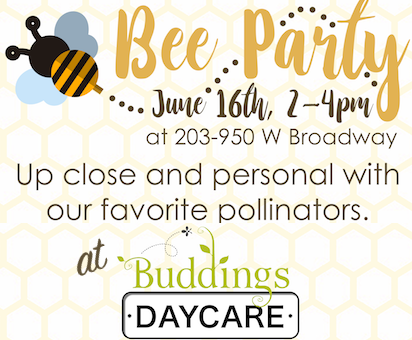 Enjoy lemonade and honey muffins, ukulele music, and facepainting, with all donations going to raise the profile of our favourite pollinators – through the programs at Hives for Humanity.